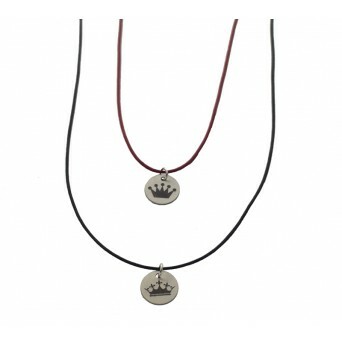 Handmade coin bracelets with crowns for couples.The male one with a black crown on a coin from platinumplated 925o silver with black cord with tied 3mm black lashes and the female one with a black crown from pink goldplated silver on a burgundy cord with tied 3mm hematites.It fluctuates in size as it is tied with macrame knotting.A modern jewel to share with your other half. Handmade set of two infinity couples' bracelets. The men's bracelet is made of black rhodium sterlin..